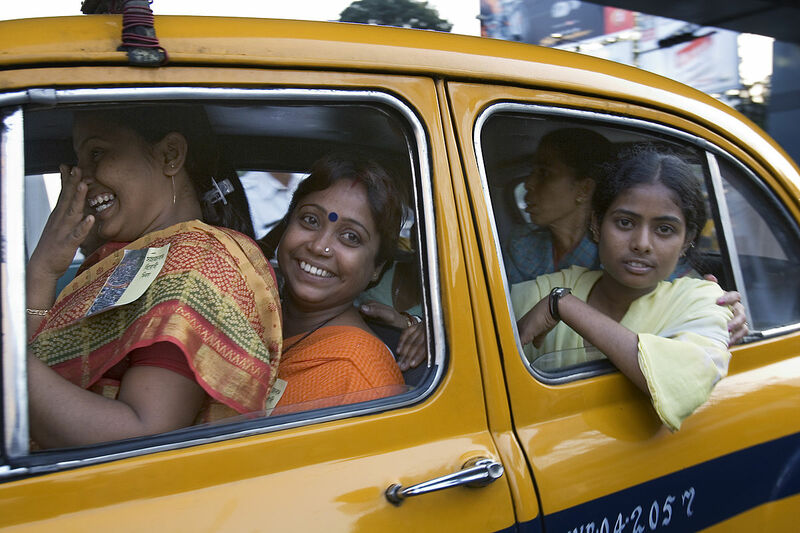 Happy Indian Girls in Kolkata. By Jorge Royan, Argentina. Published April 10, 2014 at 1200 × 800 in Welcome home	~ Post a comment or leave a trackback: Trackback URL. Love this one to bits. You know, they are not manufacturing Ambassadors anymore, sadly. I had my most exciting moments in one of these old cars. They were totally reliable (and when they were not, a piece of string or old wire would put the darn thing back together again and off we would go.) I remember many a time, being in an ambassador, while climbing up the steep hills towards Kodaikanal (Tamil Nadu). Those hairpin bends used to scare me witless! This shot is definitely one of my favourites too Eve; it has such a joyous feeling, and I feature it on the home page here because of this. I didn’t know that the Ambassador had gone out of production, and read the Reuters article you linked to with interest. Neither did I know that it was based on the Morris Oxford, which I should have recognised really. Such a shame that the ‘Grand Old Lady’ is finally retiring – though doubtless she’ll be seen around the streets of Kolkata for many years to come, tied together with string and wire of course! I’ve just looked up Kodaikanal to see where you’re talking about. What an extraordinarily beautiful place it is with those waterfalls, lakes, caves and magnificent rocks! Glad you made it around all those hairpins Eve. Thank you for this fantastic collection of humanity in all it’s beauty. A joy to see. What a very beautiful comment for me to receive on behalf of the artists whose work I show here. Thank you so much Jack; I greatly appreciate your kindness and sincerity. All best wishes, Hariod.